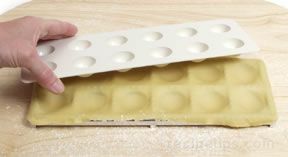 "I have not made pasta since I was a little girl cooking with my great ... read full review"
When making stuffed pasta, the pasta dough should be rolled thinner than when making other pasta because the stuffed pasta requires two layers. 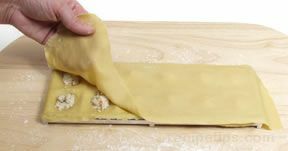 Using thinner layers will prevent the edges of the stuffed pasta from becoming too thick. 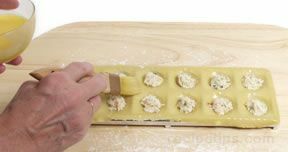 The pasta dough for stuffed pastas should not be allowed to dry before beginning the preparation process. It is best to have the pasta moist so that the layers will stick together better when sealed. 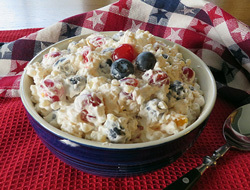 Fillings can be as simple as one or two ingredients to several ingredients used in special recipes. Ingredients, such as meats, fish, cheese, vegetables, and herbs, are used in preparing fillings for stuffed pastas. It is common for eggs to be used in fillings to bind ingredients together. 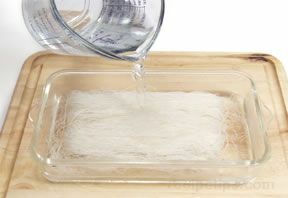 The filling used should be as free of moisture as possible to prevent the pasta from becoming soggy. Remove as much moisture as possible from all ingredients before mixing together. 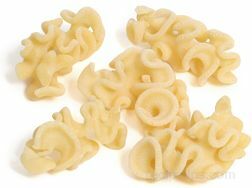 If using a moist filling, do not let the pasta set too long before cooking because the moisture from the filling may cause the pasta to stick to the surface where it has been placed. 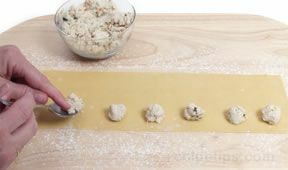 Be sure the filling is completely prepared before starting to work with the pasta so the pasta does not dry out while you are preparing the filling. 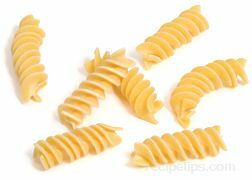 When adding filling to pasta, do not over fill because too much filling will not allow enough room for the edges to seal properly. 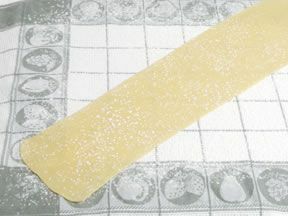 Roll the pasta dough into a rectangle shaped sheet. 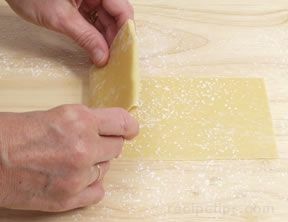 Using a knife or fluted pastry wheel, square off edges so you have a sheet large enough to cut two 4 x 12 strips of pasta. 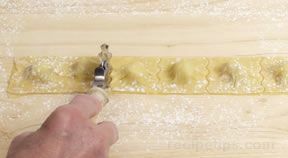 Cut the two pasta strips and place them on a floured work surface. Working with one strip at a time, place teaspoon size mounds of stuffing along one side of the four inch strips. Space each mound about 1 inch apart, leaving approximately ½ inch on each edge. 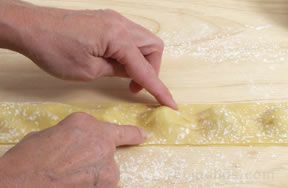 Moisten the area of pasta around each mound with water or beaten egg using a pastry brush or your fingertip. 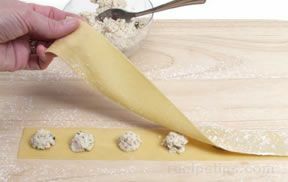 Fold over the side of the pasta strip that does not contain any filling so that it covers the side with the filling. Press firmly around each mound, sealing the two layers together. 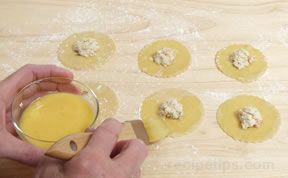 Using a knife or fluted pastry wheel, cut between each mound to create individual ravioli. Crimp the edges of the ravioli with a fork to ensure that they are sealed properly. 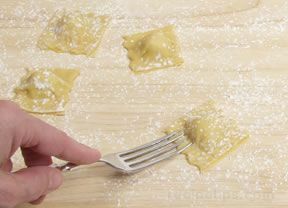 Place the finished ravioli on a floured surface and lightly dust them with flour. Allow the pasta to dry for approximately 15 minutes before cooking, but no longer than 30 minutes. 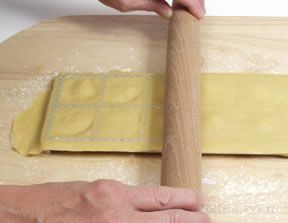 Strips of Ravioli - Instead of using a full 4 inch strip that is folded over, individual 2 inch strips can be used. 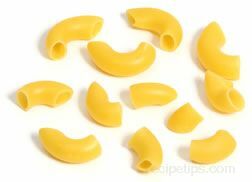 Place mounds of filling on one of the strips, and moisten the pasta between and around the filling. Place the remaining strip of pasta on top of the strip with the filling. Press firmly around each mound, sealing the two layers together. Cut into individual pieces and crimp edges. 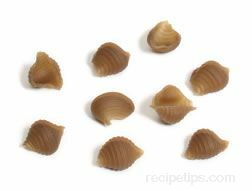 Dry pasta as shown above. 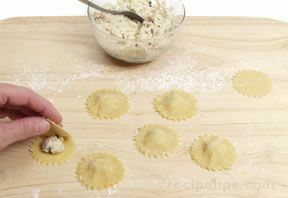 Individual ravioli - Cut the sheet of pasta into individual squares or use a circle pasta cutter to cut individual circles. Place approximately 1 teaspoon of stuffing on each individual pasta circle or square. Moisten the edges and place another circle or square on top. Press firmly around the edges and crimp to seal properly. 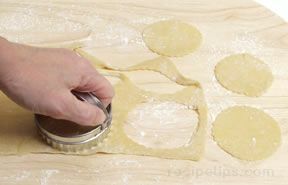 Ravioli Tray - Lightly flour the form tray and place a sheet of rolled pasta on top. Press the dough into the depressions of the form tray using the depression mold. Fill the depressions with stuffing and moisten around all edges of the stuffing. 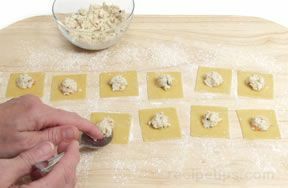 Place another sheet of rolled pasta on top the form, covering the stuffing. 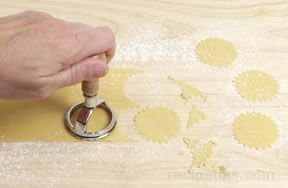 Run a rolling pin over the top of the form to seal and cut the individual ravioli. 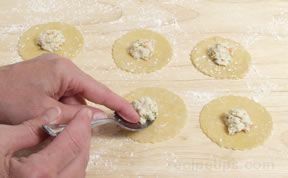 Tip the tray over to release and remove the ravioli from the tray. 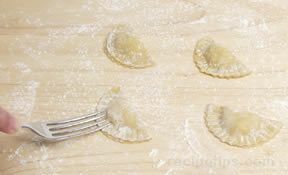 If the ravioli are not cut all the way through, forming individual pieces, use a knife or pastry cutter to cut them apart. 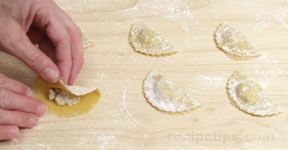 Crimp the edges to seal properly and allow ravioli to dry for 15 minutes on a floured surface. 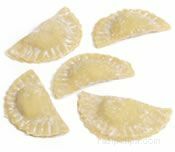 Agnolotti is made basically in the same manner as ravioli except the ending shape of the pasta is a half moon. 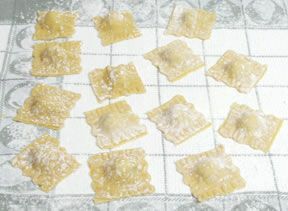 Individual agnolotti shapes are cut in squares or circles. Place the filling in the center of the square or circle. Moisten the edges with an egg wash or water to help edges seal properly. Fold the shapes in half and press firmly along the edges to seal. If using a square, the shape must be cut into a half moon shape using a round pastry cutter or cookie cutter. 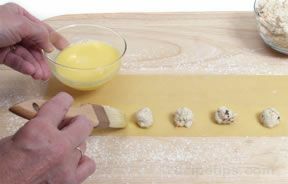 If using a circle the agnolotti will already be a half moon shape once it is folded in half. Crimp edges with a fork to ensure the edges are properly sealed. 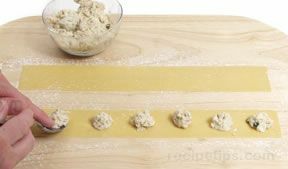 Place the finished agnolotti on a floured surface and lightly dust them with flour. Allow the pasta to dry for approximately 15 minutes before cooking, but be sure to cook it within half an hour, otherwise the pasta will begin to discolor and become damp. 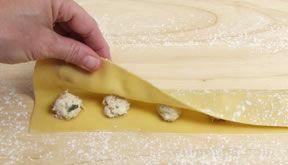 From a thinly rolled pasta sheet, cut 1 1/2 to 2 inch squares using a sharp knife. 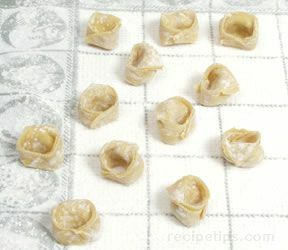 Tortellini can also be made using round pasta pieces which have been cut using a cookie cutter, pastry cutter or a glass. 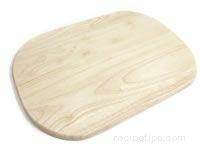 Circles are generally 2 to 3 inches in diameter. Drop approximately 1 teaspoon of filling in the center of each square. The amount of filling will vary according to the size square you are using. 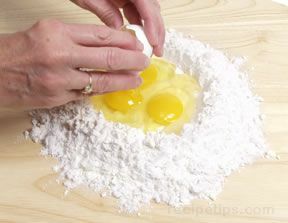 Using a pastry brush or your fingertip, moisten the area of pasta around each mound with water or an egg wash. Fold squares in half, folding one corner over to the opposite corner, forming a triangle. Press edges firmly to seal properly. 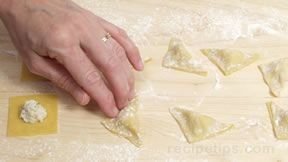 Wrap the pasta around your forefinger with the tip of the triangle pointing down the back of your finger. Bring the two corners together and pinch to seal. 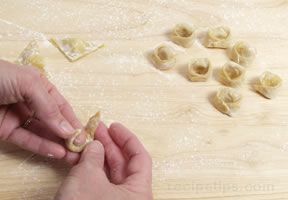 Turn the tip of the tortellini back down towards the pasta to form a flap and then gently pull off your finger. 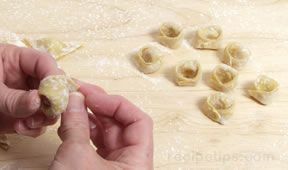 Place the finished tortellini on a floured surface and lightly dust them with flour. Allow the pasta to dry for approximately 15 minutes before cooking, but be sure to cook it within half an hour, otherwise the pasta will begin to discolor and become damp. "I have not made pasta since I was a little girl cooking with my great grandmother. What an easy way to get back into it."